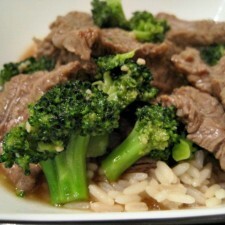 As a continuation of my “Chinese food at home” kick I was on, I made beef and broccoli the other night. This one is definitely a keeper and it would have gone even better with the homemade egg rolls I made last month! Marinate the Beef: Stir together the beef marinade ingredients in a medium bowl. Add in the slices of beef and stir until well coated. Set aside at room temperature for at least 10 minutes. Make the Sauce: Stir together the sauce ingredients in a small bowl until well combined. Set aside. Blanch the Broccoli: Cook the broccoli florets in a large pot of well-salted boiling water for 1 to 2 minutes or until crisp-tender. Using a slotted spoon, remove the broccoli from the boiling water and ‘shock’ the florets immediately in ice water to stop the cooking process. Drain well, dry and set aside. 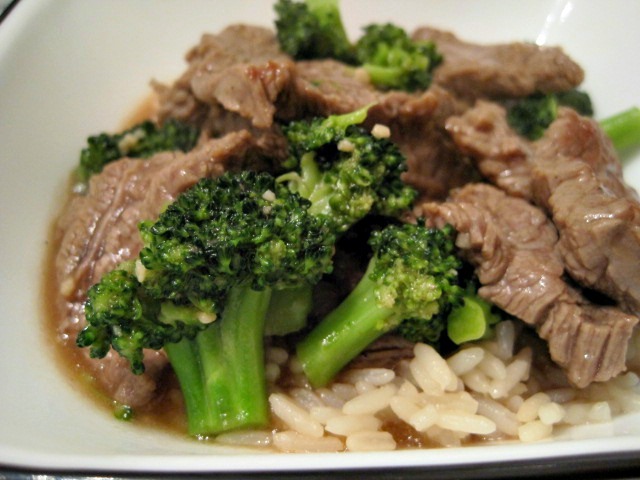 Make the Broccoli Beef: Heat the 2 tablespoons of coconut oil in a large skillet or wok over set over high heat. Add the marinated beef to the pan in a single layer, making sure that each pieces lays flat against the bottom for maximum surface contact. Let the beef fry for 1 minutes without turning or flipping. Turn the beef over, add the garlic to the pan and allow to fry for another 30 seconds or until no longer pink. Stir the contents of the pan and pour in the sauce, add the blanched broccoli and bring to a boil. Add the dissolved cornstarch liquid and simmer until slightly thickened, about 30 more seconds. Take the pan off the heat and serve immediately with white rice.